How many times have you heard someone complain of ongoing knee pain that has been treated multiple times with no results? In a lot of cases the knee is the source of the pain, but the cause of the problem is weakness in the hips. Knee pain is a very common complaint we treat at BodyTech Physiotherapy for people of all ages and activity levels. At BodyTech Physiotherapy, we look at all the contributing factors that could be causing your knee pain. One key factor that is often missed is the link between the hip and the knee. Weak hip muscles can cause a person’s form to break down slightly, even for everyday activities such as going up and down stairs. Weak hips cannot sufficiently control the motion of the legs. This weakness and loss of proper form places unhealthy stress on the knee joint, resulting in knee pain. In order to treat this type of knee pain, the mobility and strength of both the hip and knee must be restored, as well as correct form must be retrained. Many people attempt to treat their own knee pain by doing common hip and knee strengthening exercises. However, the most frequent mistakes made when performing exercises are incorrect form during the exercise or starting with an inappropriate exercise; both of which increases the stress on the knee joint resulting in further pain. Our physiotherapists at BodyTech Physiotherapy are trained to recognize and correct these exercise mistakes, as well as prescribe individualized exercise programs that will target the specific muscles at fault and are appropriate for your recovery and activity level. In addition to helping you return to pre-injury levels, our physiotherapists at BodyTech Physiotherapy will provide you with the education and exercises you will require to help maintain your proper form and function, which in return will decrease your risk of re-injury. 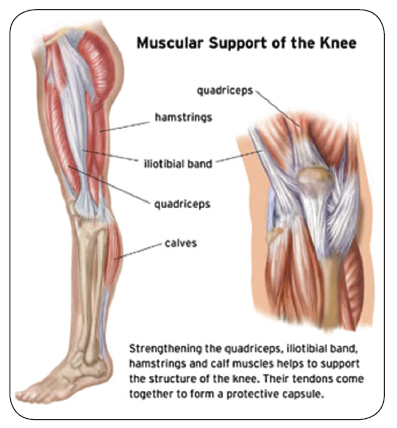 This entry was posted in Kitchener Physiotherapy, Knee Pain, Pain Relief, Preventative therapy on June 10, 2014 by bodytechphysio.